Yaneer Bar-Yam, Non-technical explanation of the breakdown of Neo-Darwinian — Gene Centered view, New England Complex Systems Institute (February 29, 2016). Statistics was developed in conjunction with the Neo-Darwinian view of evolution by Fisher . In the 1920s, statistics was a powerful new approach to describing how parental genomes combine to become those of offspring (Mendelian inheritance). In the approach he used, each offspring is treated as one instance of all possible combinations of parents. However, this is an approximation whose significance is still not widely understood. To make the discussion easier to follow, we will use the “rowers’ analogy” Dawkins introduced in his book The Selfish Gene , to explain both the statistical approximation and its breakdown. 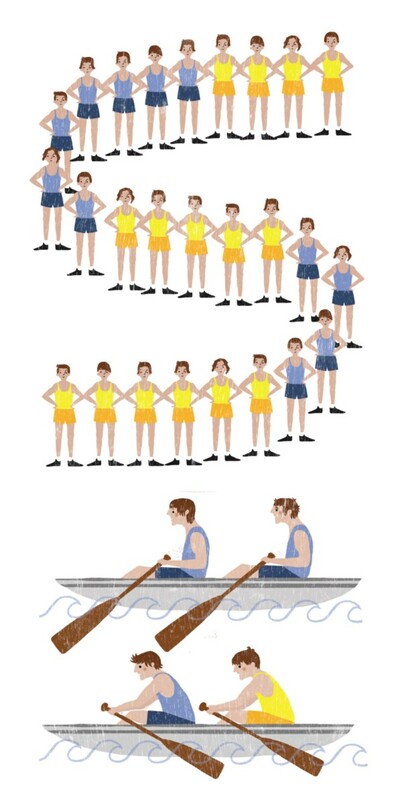 In the rowers analogy, we think about races between teams of rowers in boats. A rower is analogous to a gene, and a boat is analogous to an organism. There is a “rower pool,” with rowers that are placed into boats, with all boats having the same number of rowers. The boats run heats against each other and the winners are placed back into the rower pool to compete again. To make up for the rowers that lost so that we always have the same number of them, the rowers “replicate,” i.e., the the number of successful rowers are increased in number while retaining the same qualities. An example Dawkins describes is a competition between English speaking and German speaking rowers. The languages affect the race because one-language boats have an advantage — the rowers can understand each other — and win. What will happen over time to the rower pool? If there are more English speaking rowers, there is a higher probability that a boat will have all English rowers. Moreover, German speaking rowers will tend to have English speaking partners. This means that English speaking rowers will win the race more often than German speaking rowers. Over time, the number of English speaking rowers will grow and the number of German speaking rowers will shrink. Eventually there will be an all English speaking rower pool. Alternatively, if we start out with a rower pool that has more German speaking rowers, over time the number of German speaking rowers will grow, and we will end up with an all German speaking rower pool. In either case, we can think about this as a competition between the rowers, with one type of rower winning over the other type over time. Dawkins’ argument seems reasonable, but a hidden assumption has surprisingly far reaching consequences [3–8]. The assumption is hidden in how rowers are placed into and taken out of the rower pool. He assumed that this would be done at random. What happens if we don’t do this? Consider, for example, what would happen if we have a rower pool as a line of rowers. We take rowers out of the front of the line and put them into the boats, then place the rowers that win back into the rower pool at the back of the line. The dynamics would be very different. At a certain place along the line of rowers, rowers will tend to become the same type, English or German speakers. However, the type that is found may be different in one part of the rower pool line than another. The boundaries between patches might move from time to time. Nevertheless, the existence of patches makes the process quite different from the mixed rower pool. One way that process is different is that both English and German speakers persist for a very long time. It might happen that one or the other of them will disappear eventually, but it will take many more generations for this to happen if we have a line as a rower pool than if we mix them up every time. Interestingly, this might also be the reason that there are English and German speaking people. If everyone was mixed frequently in the world, then it would make sense to have only one language, but if people who speak German live in one part of the world, and people who speak English live in another part of the world, it is possible to have multiple languages, where some areas are English speaking and some are German speaking. It makes sense that today when people move more than in the past, there is more of a tendency to speak a single language than when people didn’t move around as much. The difference between taking the rowers at random and not at random can be understood in terms of the probability distribution of the rowers in the boats. Taking them at random means that the likelihood of a particular rower is given by the probability of the rower type in the rower pool, independent of other rower types in that boat or other boats. This is exactly the mean field (averaging) approximation, which is wrong for the linear rower pool. When we take them from a particular part of the rower line, the probability of one rower type is not independent of the type of the previous and subsequent rower that are chosen along the line because they all come from the same part of the rower pool that is much more likely to have the same rower type than the rower pool as a whole. The biological analogy of the linear rower pool is the mating of organisms that are nearby to each other geographically (or alternatively mating according to traits that lead some organisms to be more likely to mate with others of similar types, assortative mating). It is enough for animals or plants to reproduce near to the place where they were born to change dramatically the conclusions of Neo-Darwinian theory. This change is surprising to many who are not familiar with the difference between mean-field and non-mean-field behaviors. Acknowledgements: With thanks to Anne Ruozhu Sun for assistance with figures. R. A. Fisher, The Genetical Theory of Natural Selection (Clarendon Press, Oxford, 1930). Y. Bar-Yam, Formalizing the gene-centered view of evolution. Adv Complex Syst 2, 277–281 (1999). Sayama, H.; Kaufman, L.; Bar-Yam, Y. Symmetry breaking and coarsening in spatially distributed evolutionary processes including sexual reproduction and disruptive selection. Phys Rev E 62, 7065–7069 (2000). E. Rauch, H. Sayama, Y. Bar-Yam, Relationship between measures of fitness and time scale in evolution. Phys Rev Lett 88, 228101 (2002). Werfel, J.K.; Bar-Yam, Y. The evolution of reproductive restraint through social communication. PNAS 101, 11019–11024 (2004). Y. Bar-Yam, Making Things Work (NECSI Knowledge Press, Cambridge, 2004).